Boardman - Robert E. Johnson, 89, died Friday evening, February 1, 2019 at Shepherd of the Valley in Poland, surrounded by family. Robert was born May 31, 1929 in Youngstown, a son of Adolph and Helen (Nelson) Johnson. 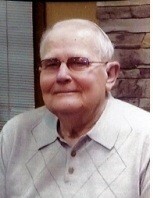 A lifelong area resident, Robert was a 1948 graduate of South High School. After graduation, he enlisted in the United States Army, serving mostly in Germany. He was a member of the Army Band, playing the clarinet. At the age of 16, Robert began working for Adolph Johnson & Son Company as a truck driver. After returning from his military service, he began working for the company again as a carpenter, retiring at the age of 62 as a foreman. While with the company, he worked on building over a dozen local churches and schools, including his home church Western Reserve United Methodist Church. He truly had a passion for his trade and continued his carpentry and woodworking well into in his retirement. He could often be found making furniture, cabinets, crafts, and helping family and friends with remodeling projects. He also enjoyed watching sports and rooting for the Ohio sports teams. He was a charter member of Western Reserve United Methodist Church, a member of the Hillman Masonic Lodge, the VASA Lodge, his High School Class Reunion Committee, and the Carpenters Local Union No. 171. He leaves his wife and high school sweetheart, the former Shirley M. Goodhart, whom he married August 26, 1950; son, Scott (Joanne) Johnson of Bend, OR; daughter, Terri (Greg) Lombardo of Boardman; three grandchildren, Staci (Keith) Sikora of Youngstown, Kegan Johnson of Walnut Creek, CA, and Marissa Johnson of Denver, CO; and sister-in-law, Mary Lou Johnson of Austintown. In addition to his parents, he was preceded in death by his brother, Norman Johnson and two sisters, Dorothy Fisher and Alyda Johnson. A funeral service will be held on Tuesday at 11 a.m. at the Davis-Becker Funeral Home, 8536 Market St., Boardman, with Rev. Russ Adams officiating. Interment will be at Forest Lawn Memorial Park. Family and friends will be received on Monday from 5-7 p.m. and Tuesday from 10-10:45 a.m. at the funeral home, prior to the service. Although flowers are beautiful, the family suggests that memorial tributes take the form of contributions in Mr. Johnson's name to Hospice of the Valley, 5190 Market St., Youngstown, Ohio 44512 or to a charity of the donor's choice. The family would like to express their appreciation and thank the staff of Hospice of the Valley for their wonderful care this past week and Shepherd of the Valley in Poland.